Caleta de Fuste is a man-made, low-rise resort catering for north European visitors looking for a home-from-home holiday experience. The beach and the port are the centres of attention with boat trips and windsurfing providing the main alternatives to sunbathing. There is also a championship golf course within the resort. Caleta de Fuste Beach is set around a bay and offers a broad stretch of dark man-made sand, shelving very gently into the water. It may be one of the less attractive beaches on the island but there is plenty of room for everyone and it is ideal for young families. It is also a good place to learn windsurfing with schools on or close by the beach. The port is home to watersports operators offering jet-skiing, windsurfing and diving. Sea excursions include the Oceanarium Explorer, a glass-bottom submarine-style craft (it doesn’t actually dive! ), and a catamaran which boasts a high success rate spotting dolphins and whales. 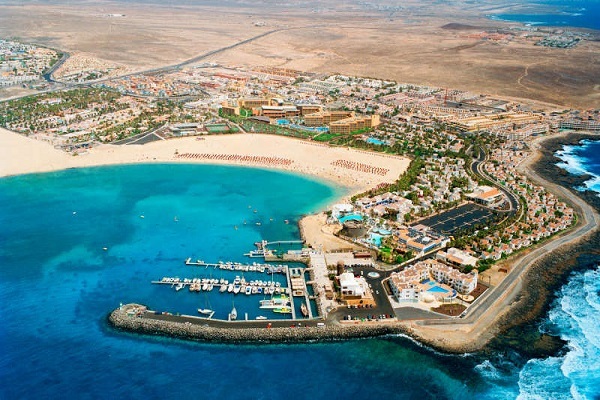 On the other side of the main road, 2km (1.2 miles) from the beach, is the Golf Club Fuerteventura. This is currently the only course on the island (more are in progress). Although this is a championship course, no handicap is required to play here. Caleta de Fuste has been designed with families in mind and children are accommodated everywhere. The port has a small aquarium and older children will enjoy the ‘submarine’ excursion. Adjacent to the beach are trampolines and mini golf. There is a 10-pin bowling alley on the main Carretera Jandía road.